Hi friends, really we (me and mom) having confusion with what to cook for Breakfast, lunch and dinner. 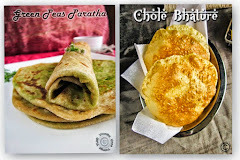 I will suggest some recipes, but my mom not interested in it, if she says something I won’t interest :P coz, she always love to cook and eat traditional South Indian foods, but I would like to taste other regional foods too, as I wish to try those in home. Sometimes I will prepare fo my choices for me and brother. I will try different ways of kurma each time. I tried this kurma for rice. 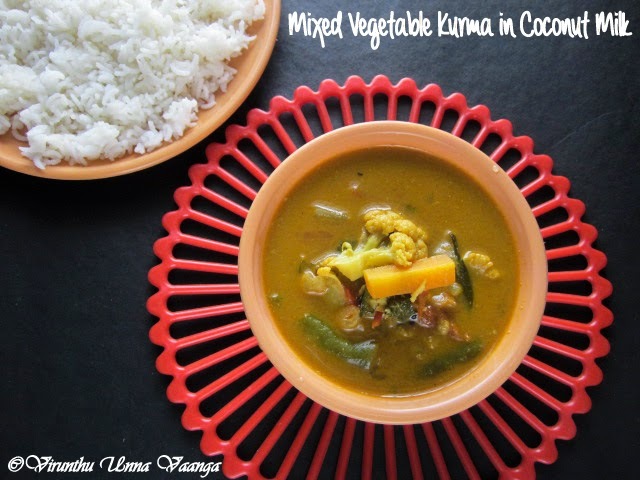 Today I post mixed vegetable kurma with coconut milk and dash of tamarind extracts which give unique taste and flavor to the kurma. We all love this kurma a lot. 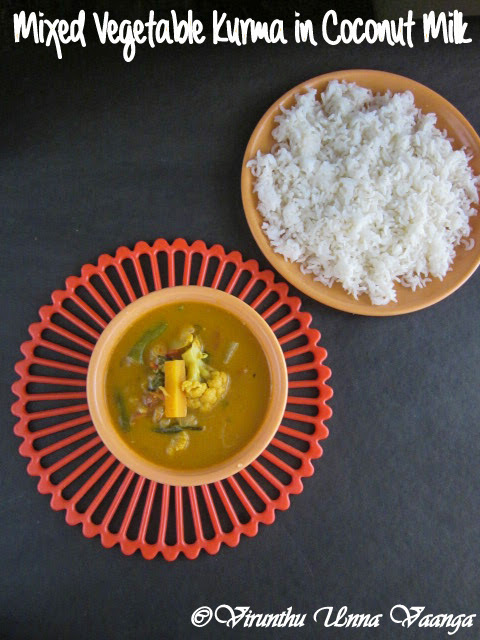 Very healthy combinations and delicious taste with chapathi and rice but my favorite combo of the kurma is Idli… Idli will absorb the kurma so it will be very juicy and flavorful. Heat oil in a pan; add cinnamon, cloves, cardamom and bay leaves after saute add fennel seeds and mustard seeds wait it for splutter. Add onions saute it for 1 minute, then add ginger garlic paste and green chillies saute it till goes raw smell. Add curry leaves and tomatoes and saute it well then add mixed veggies mix it once and cover with lid for 10 minutes on low flame. Now add all spice powders and stir it till the raw smell of spices goes off. 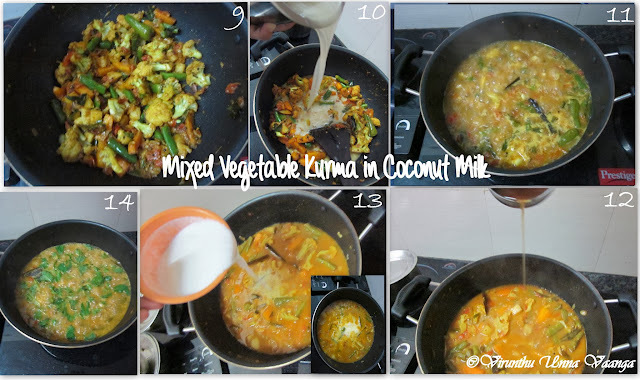 Add second coconut milk and cook on medium flame and check whether the vegetables cooked or not. 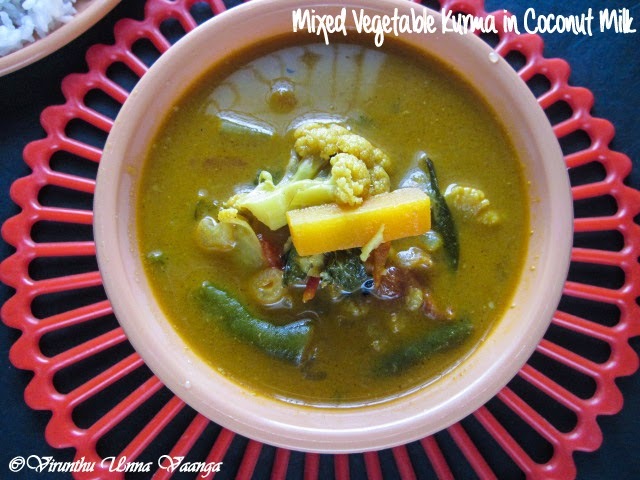 Add tamarind extract and allow cooking for 3 minutes, then add thick coconut milk and cook it for 5 minutes. Switch off the flame and add mint and coriander leaves for garnishing. Tamarind extract is optional, if your tomato will be good tangy then no need to add tamarind. Can replace tamarind extract with lemon juice but add lemon juice in final. 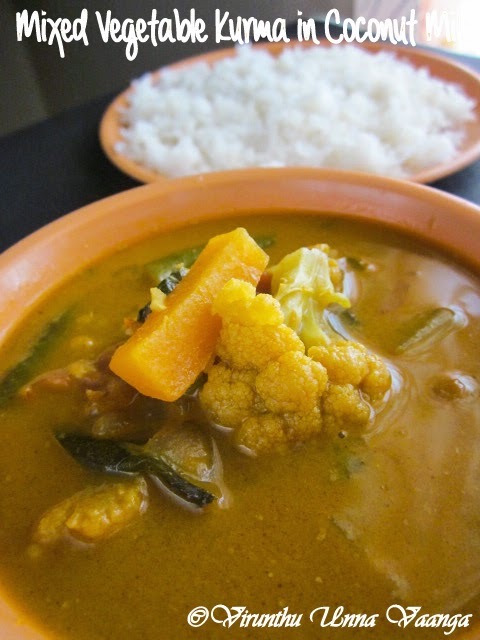 Adjust spices and consistency of the kurma with your taste. 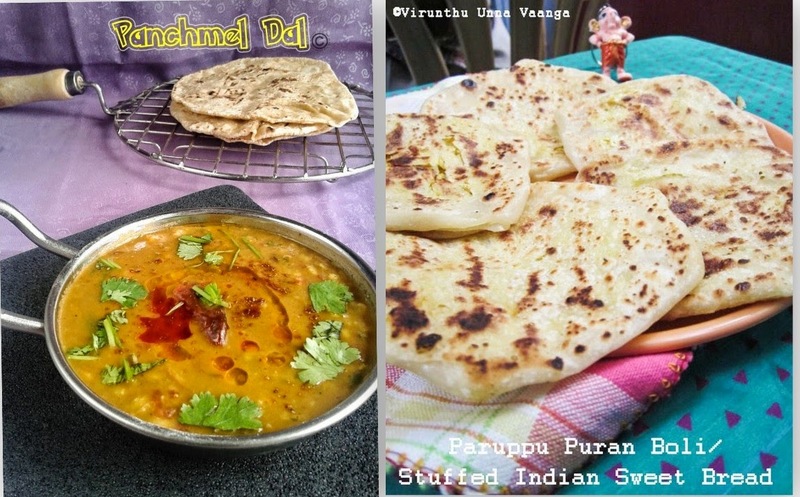 Best suits for idli, dosa, rice and chapathi. 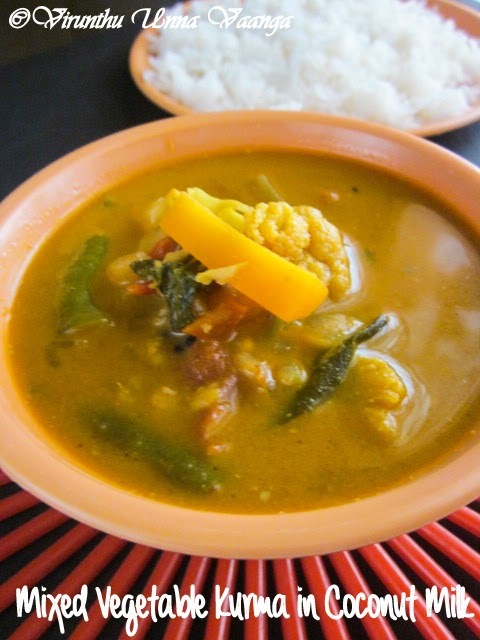 DELICIOUS, HEALTHY AND FLAVORFUL OF KURMA!!! very very healthy and delicious kurma there :) so many spices would have made them very flavorful :) tempting me !! Yummylicious kuruma viji.Adding of coconut milk makes it more creamy and yummy. 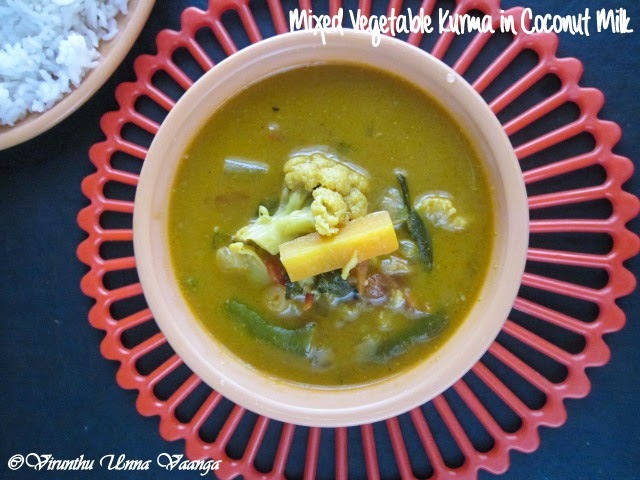 nice and flavorful kurma, never added tamarind in coconut milk kurma..will try it next time...nice clicks da..